Donned in yellow shirts, headbands and ribbons, the anti-corruption advocates trooped to the Office of the Ombudsman to call on Ombudsman Merceditas Gutierrez to immediately vacate her position. The group also pressed for the prosecution of former president and now-Pampanga Rep. Gloria Macapagal-Arroyo together with her family and cronies for their alleged “high crimes” against the people. In a statement, former Akbayan Representative Risa Hontiveros said the people must mount a new type of people power against corruption. “Twenty five years ago, we removed a corrupt regime by harnessing our collective strength as a people longing for change. 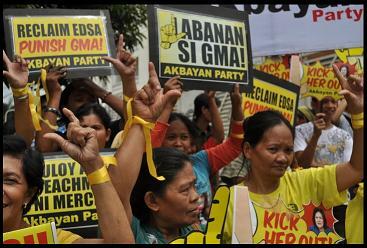 Now, we are urging the people to once again tap that power to defeat the modern enemies of Edsa who are thwarting our efforts to realize important reforms,” former Akbayan Representative Risa Hontiveros said. “The transgressions of these irredeemable individuals will ultimately catch up with them. The ombudsman who only shows mercy to erring public officials will be impeached. Kaya kung ako sa kanya, huwag na niya hayaang umabot pa sa ganoon. Lisanin na niya ang opisinang inabuso niya,” Hontiveros said. On the other hand, Arroyo, who Hontiveros said presided over the country’s affairs in an “exceptionally corrupt manner” and with “the same tyrannical streak” as that of Marcos, will “have her day”. “The legal and institutional fortifications she built to protect herself are gradually eroding. Sa dulo, mananagot si Gloria,” Hontiveros added. On Tuesday, the Committee on Justice voted 21-5, to proceed with the impeachment proceedings against Gutierrez. The committee also ordered her to respond in 3 days upon receipt of the letter, to respond to the case against her. The vote was taken despite the dilatory tactics made by Arroyo’s allies inside Congress. Hontiveros said the removal of Gutierrez from her post would make Arroyo vulnerable to prosecution. 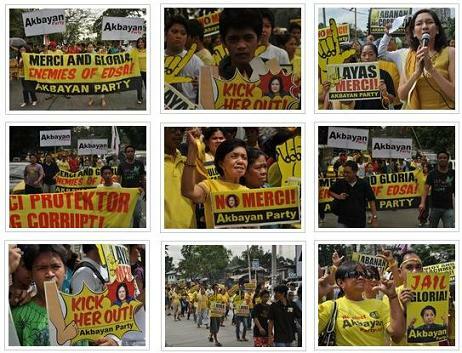 “A Gutierrez-free ombudsman will certainly commence the process of making Gloria accountable. The seemingly impervious Arroyo will now be open to prosecution,” Hontiveros said. In the middle of the activity’s program, Akbayan announced Hontiveros’ 45th birthday. The group gave her flowers as they greeted her. Hontiveros thanked her supporters and fellow party members. “I have only one wish for this year. I hope before the year ends we will see a new ombudsman presiding over a reformed office of the ombudsman,” Hontiveros quipped. The Laban symbol first gained popularity in 1983 during the funeral of the late Senator Benigno Simeon “Ninoy” Aquino. It made a comeback during the funeral of the late President Corazon C.Aquino and was the signature of President Benigno Simeon “Noynoy” Aquino III’s campaign in the 2010 elections. We in Akbayan welcome the decision of the Supreme Court to reject Ombudsman Merceditas Gutierrez’s petition to spare her from impeachment. It is a step in the right direction in paving the way for the continuation of Congress’s impeachment proceedings and sends a strong signal that all corrupt and erring public officials under the new dispensation will have their day of reckoning. At a time when those who will benefit from the continuing deficiency of reforms and justice are apparently succeeding in blocking the people’s campaign against corruption, the decision is a welcome respite. Certainly, dog days are over. The people’s call for accountability and justice has finally caught up with the formerly “untouchable” ombudsman. However, the struggle to remove Gutierrez and reform the Office of the Ombudsman is far from over. The high tribunal’s decision is but a partial victory. It will only be complete and truly meaningful if Congress will take it upon itself to conclude this important task of removing her from public office, a task that is now placed on their hands. Hence, we request the House of Representatives Committee on Justice headed by Iloilo Representative Neil Tupas to immediately resume the delayed impeachment hearings to hasten the process of exacting accountability and dispensing justice. The legal obstacles mounted by the camp of Gutierrez trimmed down the number of days required by law to complete the procedure. Swiftness coupled with judiciousness are the necessary virtues the committee must carry out in this period, if it is to complete its task and responsibility to the public. We also call on the members of the 15th Congress to muster the political confidence to support the process of removing an obviously inept public official, cross party lines and quench the people’s thirst for reforms and justice. The ball is now in the hands of our lawmakers. They must not fail the people. Furthermore, we call on all reform advocates to be more vigilant as ever. The horizon of positive change is getting nearer. We must not let regressive forces belonging to an old regime obfuscate it. If changes are to be made, the people must win this important battle. Finally, we call on Ombudsman Gutierrez to face the music and stop dodging the process laid down by our democratic institutions. Gutierrez, on numerous occasions, and even against the popular will of the public, was given more than enough time and space to exhaust all the legal remedies to protect her from prosecution. With no less than the high tribunal allowing the impeachment process to proceed, it is incumbent on Gutierrez to make herself accountable. Now is the hour of Merci.